Branson Log Cabin at Thousand Hills Golf Resort offers a luxurious and comfortable accommodation for couples who want to spend a romantic log cabin accommodation. This spacious log cabin accommodation at Thousand Hills Golf Resort is beautifully located in a secluded place along the hillsides of the Ozark mountains. Each log cabin at Thousand Hills provides a comfortable living for intimate couples who want to enjoy a relaxing and romantic escapade. Branson log cabin is beautifully designed with the inspiration of beautiful natural setting, wildlife, and magnificent landscape around the Ozark mountains. Thousand Hills Golf Resort is one of the leaders in condominium and log cabin rentals which have been offered nightly for over 10 years now. Millions of visitors come to Branson each year to see the beautiful natural scenery, wildlife, and the beautiful panoramic views of the Ozark mountains. When these condo and cabin rentals came along, visitors had to choose which accommodation aspect they prefer most – scenery, comfort, or convenience. Staying at Branson log cabin accommodations at Thousand Hills will let you experience a luxurious way of living but affordable accommodation in a calm and tranquil environment. As guest of Thousand Hills Golf Resort, you can have the chance to play the most popular 18-hole golf course in Branson. The great location of log cabins at Thousand Hills is one of the reasons why many couples wanted to spend a romantic escapade in a secluded place in Branson. This log cabin development project of Thousand Hills is part of the 20-acre development in the area near Branson’s entertainment district. The beautiful location of this project offers a romantic escapade for couples who want to experience a relaxing atmosphere in a tranquil environment away from the crowded city streets. Branson log cabins are fully furnished with modern amenities that include free wireless internet access, cable TV with HBO, and a DVD player. The kitchen of each log cabin is fully equipped with appliances like microwave oven, refrigerator, washer/dryer, dishes, pots and pans, and kitchen wares and utensils. Thousand Hills log cabin project is perfectly situated in a secluded area to create a calm environs around the city of Branson. According to many satisfied guests of Thousand Hills, the tranquility of the place is just what makes the place interesting to stay. The convenient location of log cabins is very accessible to entertainment district in Branson where you can enjoy exciting attractions and world class entertainments. After a full day of fun with exciting attractions and live entertainment shows in Branson, you might want to go shopping at Tanger Outlet Mall. In this great shopping destination, you can buy an array of unique shopping items such as arts and crafts, collectibles, and souvenir items. Branson is such a perfect place for couples who want to enjoy a romantic retreat in a tranquil environment. 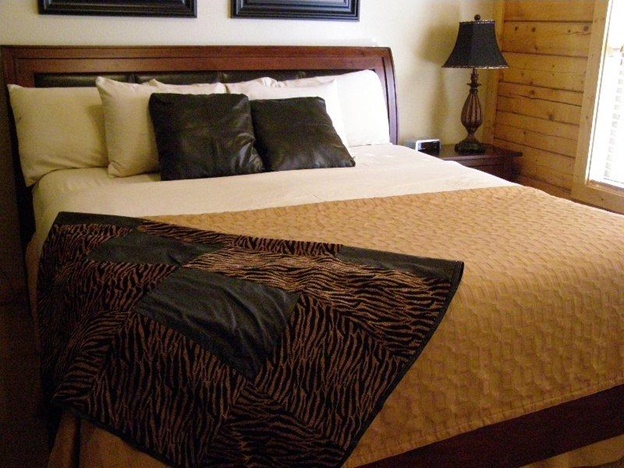 To make your romantic getaway more exciting, stay at Branson Log Cabin at Thousand Hills Golf Resort.